Lovely little lambs, originally uploaded by dancemntn. So, I sort’ve have an addiction to e-newsletters. Ok, I DO have an addiction to e-newsletters. I sign up for them all the time, mostly because I know I’ll lose touch with a lot of really cool websites that I run across. Because of that, my email box is full of stuff I’ll never get a chance to read that just go straight to trash. BUT, there is one that I read every time it pops in my inbox. It’s the Local Harvest update for my Plano area ( I’ve added Boulder,CO to that list just for laughs and giggles.) I totally recommend checking this website out and signing up for an email notification of events around you, like farmer’s markets, gleaning groups, CSA’s, and local farm happenings. Anyway, there aren’t a ton of events or postings that show up around DFW, but a couple of weeks ago I noticed a posting that was right up my alley! Cindy from Jacob’s Reward Farm in Parker had invited some of her shareholders and friends to an Easter egg hunt at the farm. I quickly emailed her to check things out and she was so gracious to have Parks and I come as visitors. The weather turned out perfect and Parks got his candy fill for the day. He didn’t want to leave, he could have just chilled with the chickens all day. (Well, he mostly heckled them……especially after one laid an egg!) We got to see their sheep, Shadrach and Zacheaus, Lucy the ewe, the baby lambs and the alpacas too. (Forgive me, I can’t remember all their names. ) After some of the guests had left, he was able to feed the donkeys, Aaron and Moses. He loved every minute of it. Cindy also showed me her cool knitting studio. I’m not a knitter, but I sure do have some friends that would have totally gone crazy! Maybe I’ll go take a class w/her one day. Check out her website here, http://jacobsreward.com/index.htm and her blog, http://www.jacobsreward.blogspot.com/ where she posts all kinds of fun things happening at the farm. Parks and I will definitely have to go back and maybe next time drag Jeff there and put him to work!!!! Footnote-Poor Jeff was slaving away that day at our storage room organizing it so we could actually get to stuff! 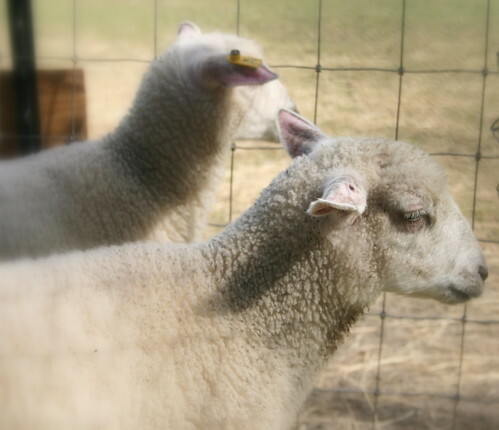 Click on the lamb pic above to see photos from the farm hunt, for eggs that is.